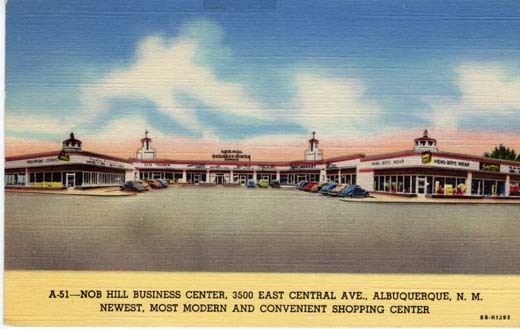 Nob Hill Business Center, 3500 East Central Ave., Albuquerque, N. M. Newest, Most Modern and Convenient Shopping Center. 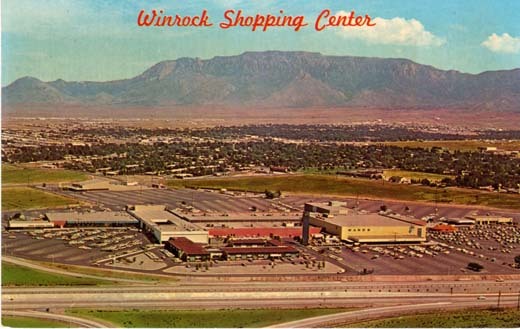 Southwest Post Card Co., Box 685, Albuquerque, N. M.
Winrock Shopping Center, Louisiana and Indian School Road, Albuquerque, New Mexico. A new, modern, and spacious shopping complex able to serve every need including beautiful hotel facilities and acres of parking. Dexter, West Nyack, N. Y.